“I had a business registered but that was as far as my understanding of business went, until I met JASA agent Zipporah Segabetla, who encouraged me to join the Youth Enterprise Development Programme, funded by Barclays. Joining, and comm itting to, the programme was the best decision I’ve ever made,” explains Jabu Sibiya, a graduate of the YEDP in Rustenburg, in the North West. “Put yourself in the shoes of community members in Robega Village. Before we opened our business, they would have to get a taxi early in the morning, spend about R40 for the round trip into Rustenburg, then another R40 to go online at an internet café – understand what that means for someone who does not have any money and is desperately job hunting to put food on the table! Sibiya attended the YEDP in 2014. During the 20-week session he learned about banking – a new concept to him as the idea of banking was always daunting in the past. Until then, his only exposure to business was through Business Studies, a subject offered at school, but even so, his understanding of business was theoretical with no real practical appreciation. 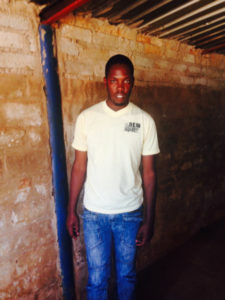 Immediately following the YEDP programme, Sibiya identified five other learners on the programme whom he believed would offer great support and commitment. Together the six-member team set out to make the internet café he had envisaged for his community a reality. Today, community members need only spend a few minutes walking to STM Internet Café and Academy where one of the six co-owners on duty will offer customised service based on the client’s need. Something the team identified during the market research module was that each community member has different needs and a different level of understanding of computers. 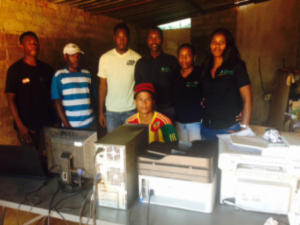 The client would have access to the internet for a mere R15 per hour, along with computer literacy training. “We teach our customers how to search the internet, type or update their CVs, or whatever other service they require our assistance with. We believe that when they learn by doing, the skills we teach them will stick”. Sibiya is proud of the role he plays in this community. But he is even more proud of the role the business plays in the lives of the six co-owners. Being located along the main road in Robega, next to the biggest restaurant and bar, and close to the taxi rank, make it ideal for clients to gain access. As a result of this prime location and the hands-on personalised service each client receives, the business was able to expand within a short space of time. At the certification event, graduates were provided with a USB containing contact details and brochures of incubator programmes with which JA South Africa has forged a relationship. Graduates are encouraged to contact incubators to take their businesses to the next level, which Sibiya and his team did, by applying for an expansion grant from the National Youth Development Agency (NYDA) and attending workshops to support their growth aspirations. We look forward to witnessing Jabu’s business grow from humble beginnings to being a beacon of light in the Robega community.